I kept putting it away for a while, because, well, the ready-made baguettes are good and fast and pretty cheap, but with all the herbs growing in my garden at the moment and with this herb series coming, I had to give it a try. And what a revelation it was! I still enjoy a ready-made herb baguette when being served one somewhere, but I think it would be a long time before I buy one again. 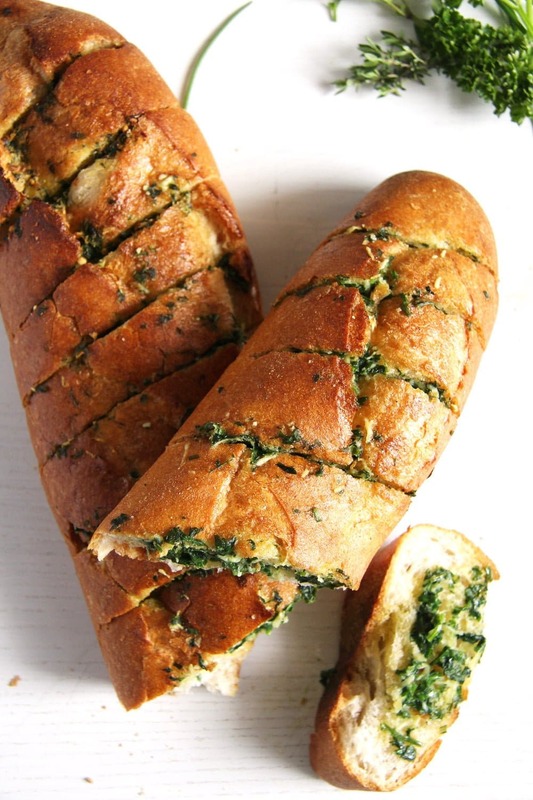 Because no herb baguette in the world can be better than this one. 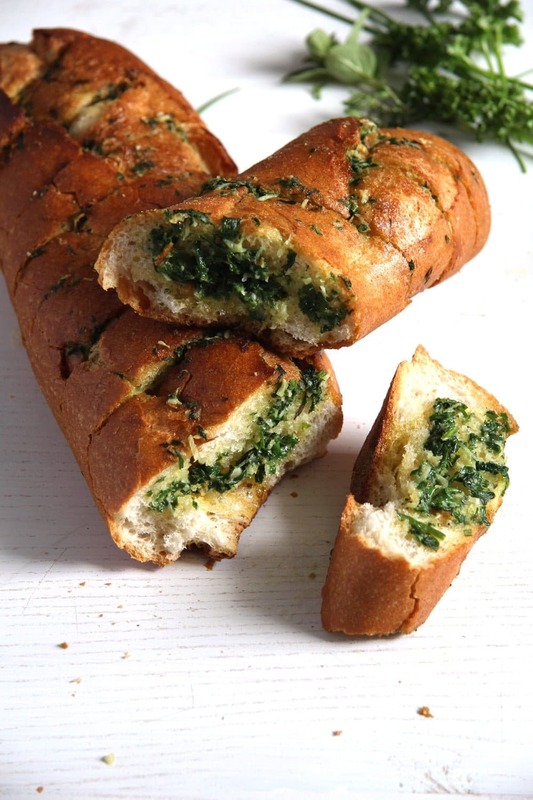 You can taste the flavor of the herbs, their freshness and greenness in a way you could never taste them in the bought version, the garlic is pungent and delicious, the melted butter is out of this world and the bread is crisp, buttery, warm and soooo comforting. I made the bread several times now and we all love it. It is very easy and quick to make, it bakes in no time and I imagine it being quite versatile. I plan to try it with sun-dried tomato – butter and olive – butter in the near future. 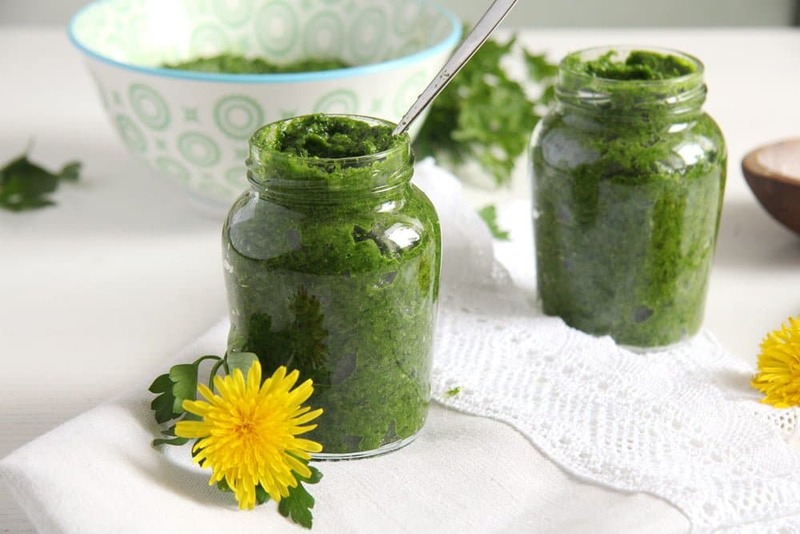 I used fresh herbs for the baguette that you can see in the pictures, but I have already made it with this amazing Herb Garlic Paste from Wednesday as well. If you, by any chance, make the paste and decide to use it for this recipe as well, just mix a few teaspoons of it with the butter and leave out the salt and garlic. I didn’t push it too far with the homemade thing, so I didn’t make my own bread this time. But I bought a really good fresh baguette at the bakery, don’t use frozen baguettes, they’re just not the same, I’ve already tried that and there is a big difference. I used parsley, chives and oregano, but you could try it with other herbs as well. Basil would be great, wild garlic for sure (use less garlic in this case) or a combination of several herbs of your choice. I hope you give this recipe a try, it is really worth it. You can have this on its own with some salad or in summer with grilled stuff in the garden. I haven’t tried it, but I am pretty sure you could place this baguette on the grill as well, to make it warm. If you try that, let me know how it works! Take the butter out of the fridge and let it get soft. Chop the herbs very finely. Peel and finely grate the garlic. Mix everything together and add some salt and pepper to taste. You can chop and mix in the food processor as well. 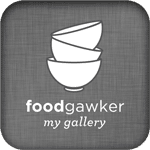 If you are using the Herb Garlic Paste from Wednesday, mix 2-3 teaspoons of it (or to taste) with the butter and leave out the garlic and the salt. Add some pepper. Slice the baguette at regular intervals but don't cut all the way through, the bottom should remain whole and hold the baguette together. Cut only about ⅔ through. Smear the herb butter in between the slices. At this point you could wrap the baguettes and freeze them for future use. Wrap each baguette in aluminum foil and bake in the preheated oven for about 10-15 minutes. Serve hot. 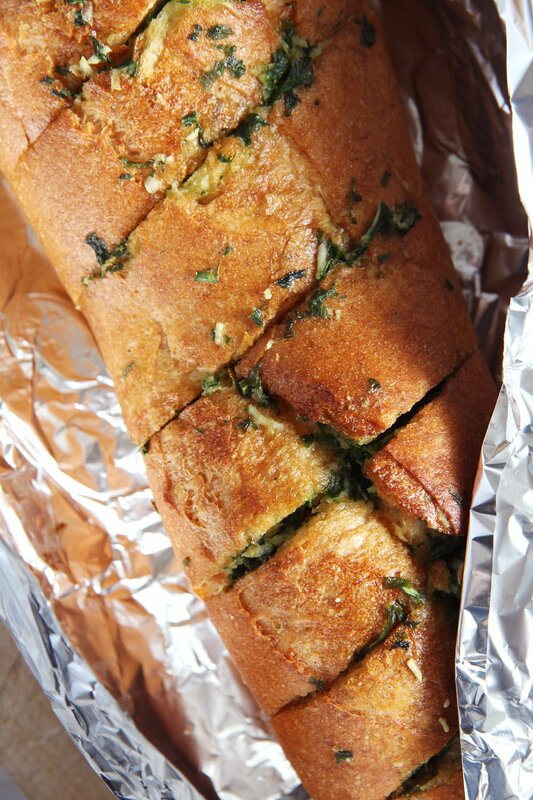 A fresh baguette loaded with herb and garlic is the best! This looks perfect and totally loaded with deliciousness! I could eat just this for dinner and be in heaven. 😉 Cheers, friend! I would give up any cake for this baguette:) Looks amazing. I am going to make the herb garlic paste and smother over regular gluten free bread. Oh Adina, this is such a beautiful looking baguette. I love herbs, I love garlic and l also love baguette. Does that mean, this recipe is calling my name! 🙂 Can’t wait to try this! My goodness – my son is just like yours! I started making my own garlic bread a couple summers ago and now that I have my little herb box going again, I make a loaf when I get a good baguette and then keep it in the freezer so we can have homemade instead of the ones from the store. It’s so good. I usually just use parsley but will have to try the other herbs. Love how yours is chocked full of it. So yummy! Hi Adina, what a gorgeous loaf!!! I love all the herbs on that crusty baguette. Heaven. I would love to eat this with a caprese salad. Oh this looks so so good! 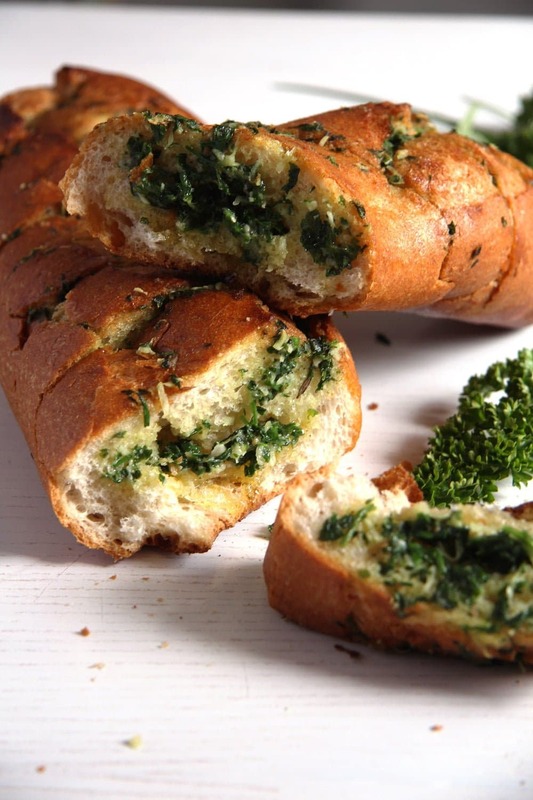 I always loved garlic bread growing up, but the addition of herbs makes it even better. Awww, this is delicious. I make my own bread, but baguettes are so hard to make, takes too much time to prove. Like you, I buy the garlic baguettes, but I think I should make them at home.